Grateful Dead mania is in full force, with the California shows right behind us (pictures, recap, setlist) and the Chicago shows coming up this weekend. As we mentioned, there’s also a late-night celebration at City Winery Chicago on 7/3 (11:30 PM doors) with a bunch of indie musicians covering the dead, including members of Real Estate, Sonic Youth, Yo La Tengo and more. Making it an even better lineup, an exciting new addition was just announced: Jenny Lewis. The full lineup is now Real Estate’s Alex Bleeker and his band The Freaks with special guests Jenny Lewis, Yo La Tengo’s Ira Kaplan and James McNew, Sonic Youth’s Lee Ranaldo, Little Wings’ Kyle Field, Little Wings collaborator Lee Baggett, Darkside’s Dave Harrington, Darkside collaborator Will Epstein, M. Geddes Gengras, Ryley Walker, and Bleeker’s Real Estate bandmate Matt Kallman. Tickets are still available, and we’re giving away a pair. Contest details below. The tribute show happens after City Winery hosts a simulcast viewing of the Dead’s Chicago show that night, which happens at Soldier Field. City Winery is hosting the Simulcast for their Saturday and Sunday shows too, and will basically be in Dead mode all week with “Weir World” shows featuring Jonathan Wilson (Tues-Thurs), Steve Kimock & Jerry Joseph (Fri-Sat afternoon), Matishayu & a member of The Disco Biscuits (Sat late night), Joan Osborne (Sun afternoon), and Railroad Earth Sun late night). Tickets for City Winery’s week of Dead celebrations are on sale. 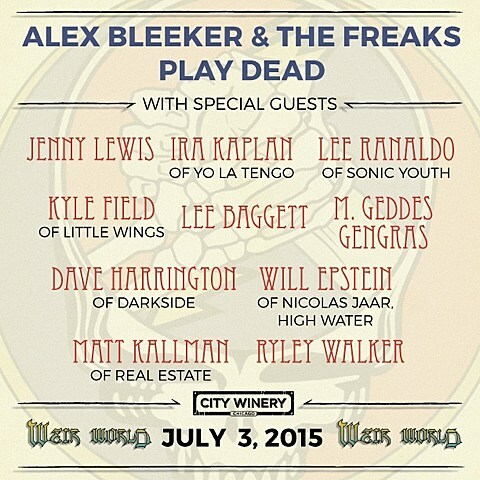 For a chance at winning tickets to Alex Bleeker’s Grateful Dead tribute at City Winery Chicago: either tweet something that includes both @BVChicago AND “ALEX BLEEKER PLAY DEAD” in the tweet, or send an email to BVCONTESTS@HOTMAIL.COM with the subject line “ALEX BLEEKER PLAY DEAD”. Include your first and last name in the email. We’ll pick a winner at random and contact them with more details. If you enter by email, it will not be shared with anyone else. Good luck!